It is an old and oft repeated statement that ‘History is written by the Winners’. However, it would be more accurate to say that History is written by those in power, those with privilege, the wealthy elite. Obviously, whoever is writing is going to defend the interests of whatever group or class they feel they belong to; they defend the status quo that ensures their position in a society. So in an unequal society, such as 19th Century ‘Famine’ Ireland, documents and accounts were written by the privileged. These upper classes lived in a different world than the people who suffered during the potato famine of the mid 19th Century. The failure of the potato crop, a staple for most Irish peasants at that time, combined with a population explosion and rising food prices to create conditions of widespread poverty and mass starvation (a huge social failure during years of a bumper harvest in all other crops except potatoes). Mass evictions put these people on the roads and byways of Ireland, and eventually, reluctantly, some of them ended up in the workhouses. I was aware of this background when visiting the ruins of the workhouse in Dunshaughlin, Co. Meath. The society of 19th Century Ireland was very unequal, but this population that starved or emigrated were not illiterate. I was aware that even present day representations of the famine can romanticise the victims, or present a false account. I was aware that 19th Century accounts are coloured, not only by the bias of the elite who wrote them, but also by a culture that could not conceive of society being ordered any other way. These people passed Poor Laws, and built workhouses to try to deal with the problems of poverty. The workhouses often contained schools, and the authorities considered themselves to be doing a good thing, offering work, food and shelter, and a moral backbone to a poverty ridden underclass (protestant work ethic?). They thought they were helping to deal with the problem, and did not comprehend the reasons why the workhouses were so unpopular. We would probably find their attitudes patronising and controlling today. The starving people who resorted to the workhouses did so as a last resort. The upper classes were unable to see why; that some people would prefer to starve than be separated from their families, that the ‘moral backbone’ and ‘discipline’ of the upper classes often amounted to capital punishment and sadistic violence; that the starving Irish saw these workhouses as originating from the same authorities that were hanging a starving man who stole bread for his family, or deporting people to the other side of the world for vagrancy (when they had nowhere to go). I was quite astonished and a little bit angry at the account on the sign above – annoyed at the omission of the reasons why the workhouses were unpopular. To omit the reasons why people did not want to enter the workhouse is to erase these peoples history, to silence their voice. Some further research showed me that there was actually an extra fever hospital built less than 200 meters from the ‘Famine Graveyard’. Why wasn’t this mentioned on the sign (above)? 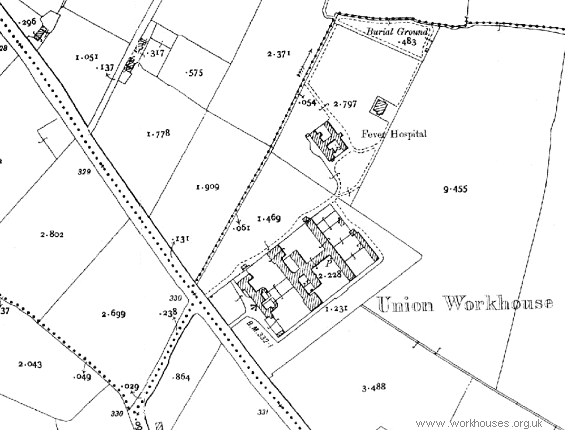 The workhouse had to be extended, and stables and extra ‘fever shacks’ were built during the height of the disaster. It seems that the politics of representing the past are still with us! Perhaps our present administration does not wish us to remember famine times, or remember our strength against foreign authorities at the moment? It is important to remember that the writing of history is always a political act, that there are many voices from the past, and that human history has never been equal or fair. I feel that psychic work can help in allowing these voiceless ones speak, have their stories known. The night before our visit to this site, we stopped at the gate on the way back from Tara, to see what impressions we could pick up, and to get a general ‘feel’ of the psychic aura of the place. We did not attempt to enter the site. My first impression was of a heavy dark energy at the gate, a massive man squatting like a toad. It certainly was off-putting, but I got a strong feeling that this was one entity, that this was the ghost of someone who had done wrong, and did not want to let anyone in to see it. 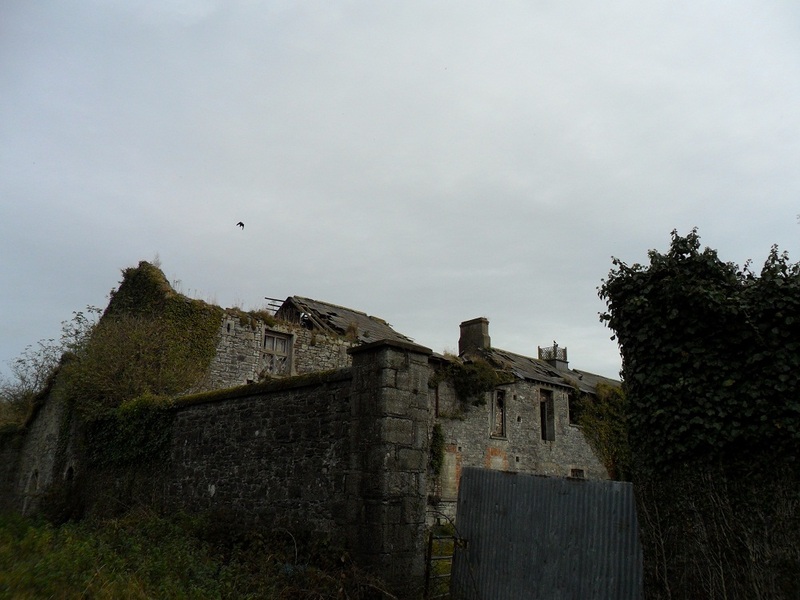 When I first heard about this workhouse, I felt that there were spirits there who wished for their stories to be told, that some light needed to be brought into the place. 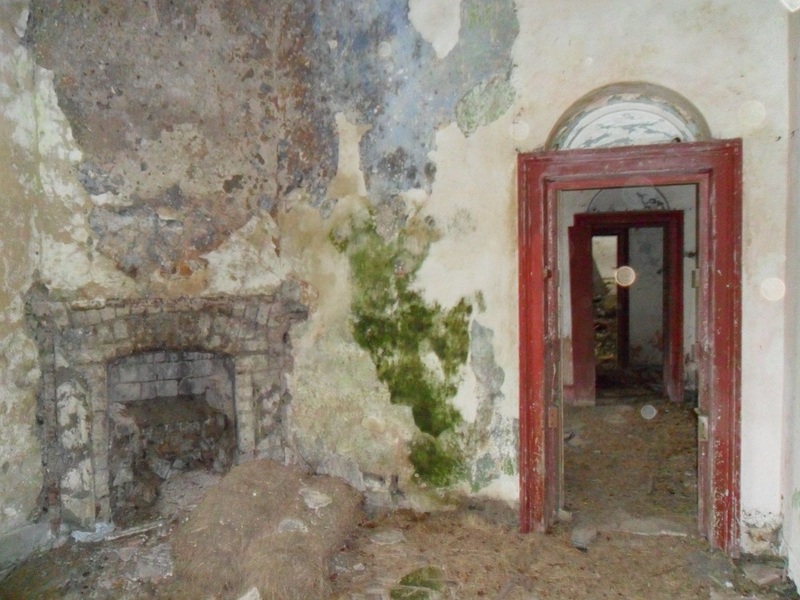 My impressions of that place are that there are some souls trapped, that there were abusive patterns there, that there is at least 3 if not 4 strong spirits who were abusers or controllers in the place, and that there are other souls held there by these patterns, or by their stories not being told. The strong sense I get is that they are saying ‘It was like this’ or ‘I can’t get home’ or ‘tell so & so I am at peace’. I feel that that entity at the gate is like a gate keeper, but in a negative sense – he doesn’t want anyone else getting in, or anyone knowing what he was doing. Fionn thought he was the cook, that he was quite horrible to the men, that he was associated with the mens section mostly. Fionn also picked up a tall man, he called him a ‘Navvy’, a man who was tall and strong, but gentle, but recieved a lot more ‘correction’ from the authorities. I heard him saying ‘How Dare You!’ and we surmised that he was the sort of man that people naturally gravitate to, a natural leader, a good man, one who would protect others, and that this caused him to suffer more than others. Fionn also picked up a girl in chains, a young girl. We decided the night before that we were not going to tackle the ‘cook’ or get pulled into any conflict or psychic tussles with any of the heavier spirits (I called them the abusers), but instead to bypass those and try to communicate directly with the ‘ordinary’ spirits, and to focus on the graveyard, bringing some crystals and well water to cleanse, and to set up a crystal grid to direct some light towards the workhouse, to help make a path for the trapped souls to release, and heal. The next day, we prepared ourselves and protected ourselves before we went anywhere near the site. The gate still seemed to be an obstacle, but the heavy ‘toad-man’ was gone. 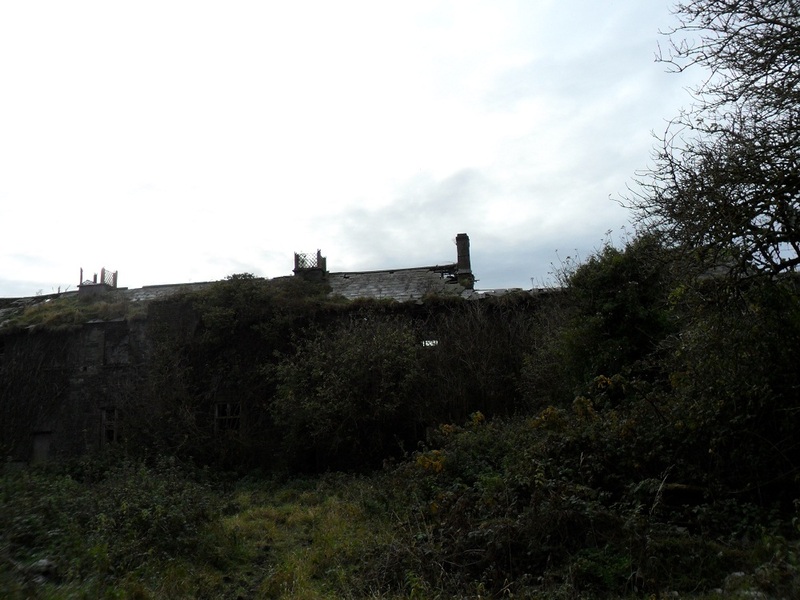 We walked around the side of the workhouse, and around the back of the rear building. I noticed some very old trees there, and got the impression of a child hiding in the trees, but also that there was no escape from the place (not because of walls, there was just a barrier). The building we entered turned out to be the infirmary, though we did not know this at the time. Pain and misery were seeping out of the walls, and there were lots of areas with ‘bad’ energy. We scattered crystals around and did some clearing work. The long rooms appeared to be about two stories high, with bunks every 3 feet – people were packed in here like sardines, or slaves on the slave ships. I kept seeing red coats. 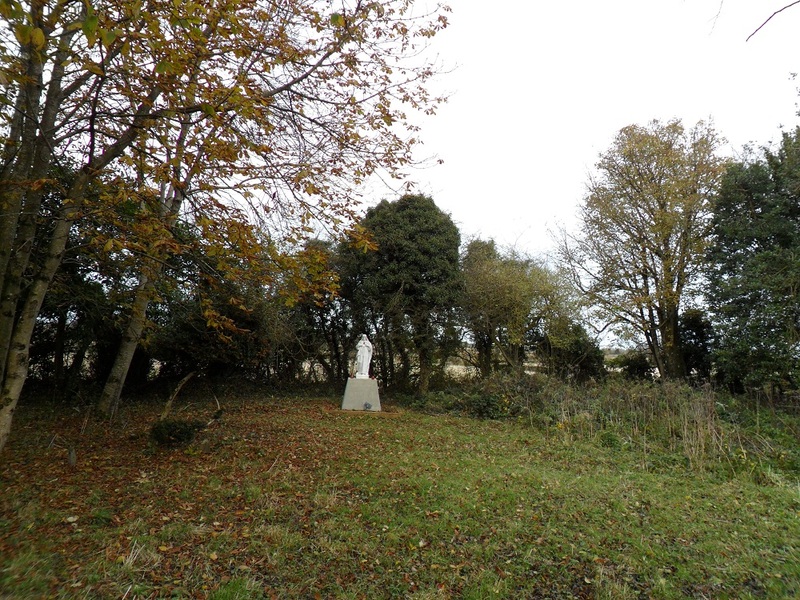 The Graveyard is situated about 500m away, across a now muddy field (although on the map, there was a fever hospital, and a path around the edge of the field). Looking back across the field at the workhouse, it appeared very ominous, forboding, forbidding. I could empathise with how it looked to the people returning from the graveyard after burying yet another loved one. The graveyard was peaceful, but sad. The feeling of the truth not being told, a sense of frustration was there. I got the sense that they weren’t happy with how they were represented. I was told that they weren’t happy with the Jesus statue, that they would have preferred Mary, that they didn’t understand or like the Masses that had been said in the 20th/21st Century. Of course, I thought, these were the people of the Mass Rocks, their worship was out in the landscape, and at holy wells, at saints statues, and Marian Grottoes, and was in Latin. The desire for a grotto or statue of Mary came across very strongly. There was a sense from some of them that they did not know who this statue was! Whatever went wrong, whatever abuses were perpetrated, it was related to men, not necessarily to women and children. All the antagonistic or dark energy in the whole place relates to men, to males. Certainly I would agree with some commentators that there is something dark there, there are terrible events that have remained unspoken, unwritten, but I did not sense any demon, nor did Fionn (who has very clear sight into this world, and is very gifted). He told me there was no demon, but not to go near the other building (across the courtyard), and not to go up the stairs. I feel that there is actual physical evidence, that there is something in the other building, and that it is being ‘guarded’ or protected by these malevolent spirits. They are projecting out fear, and strength; they are trying to hide a secret. They were abusers, their energy is also similar to the sort of people who cover up for abusers. They are quite militant. There is a man, of the upper classes, with authority and position, who stands here. He has committed grave wrongs, he was very sadistic in intent and act to the men and boys, and his disciplinary measures were severe even by the standards of the time. Despite the huge amount of fear and darkness projected by these ‘guards’, the only harm they can do comes from the fears and doubts of the person going in there. The energy is very strong, as I have said before, there is a lot of fear, and there were terrible events there that could traumatise people. My answer to the situation is to send healing and light, and to ask others to do this also. If anyone has access to newspaper archives of the mid 19th Century in Meath, I do feel that some light could be shed, some stories could be told, which will help to bring peace, resolution; justice and truth. The starvation, hunger, illness and misery and (sometimes coerced) emigrations have left a mark on the psychic landscape, but that is mostly of sadness, of regret, but of peace also. The negative vibrations of the site relate to something wrong, a sense of something that should not have happened, something that should not have been allowed. There is psychic danger here for those who are sensitive; there are some active spirits here, and it is very important to a) not go in alone b) be very strongly protected and c) prepare, and send light and healing for some time before you enter, if you must go in. I do feel that sending healing energy, and a bit of historical research could help the situation a lot. I still get the sense of Children’s spirits playing at the back of the Infirmary. 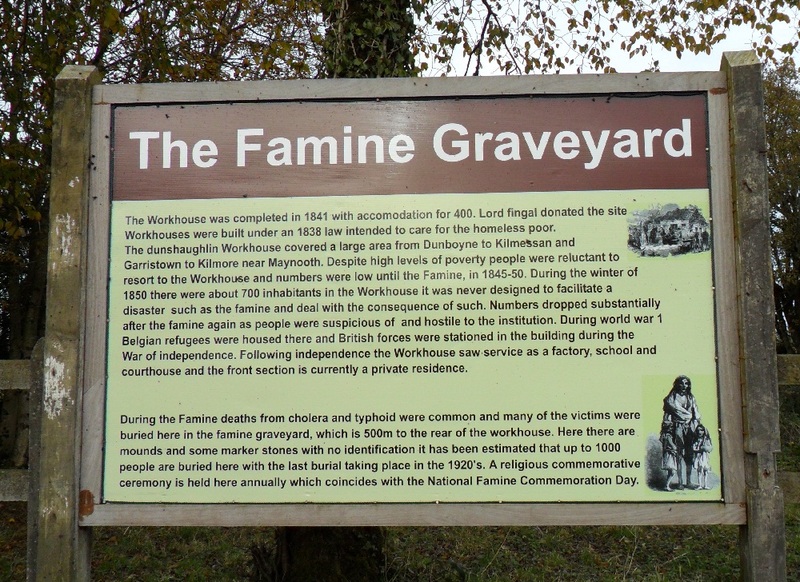 The Famine Graveyard needs visitors (who have wellies! ), and maybe even a small statue of Mary, if someone has one. The rest of the photographs of our visit can be viewed here. Sacred Sites of Ireland | Powered by Mantra & WordPress.